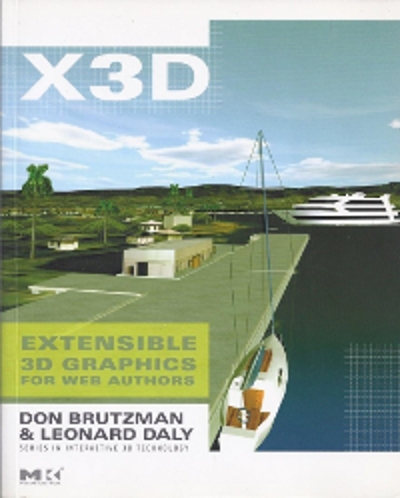 X3D for Web Authors is an introductory reference textbook for learning Extensible 3D (X3D) Graphics. 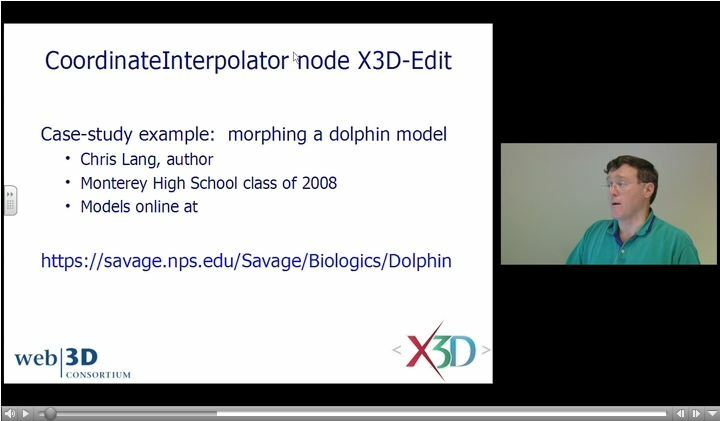 Author support includes the X3D-Edit authoring tool, X3D Tooltips, X3D Validator, complete course slidesets and course video lessons for learning X3D (also YouTube course video archive), plus this open-source scene archive. Free book download in ACM Digital Library is available for ACM and SIGGRAPH members. Grouping nodes help to organize the scene graph, can establish relative coordinate systems, and can contain most other kinds of X3D nodes. Grouping nodes include the Anchor, Billboard, Collision, Group, StaticGroup, Switch and Transform nodes. The Inline node is also similar since it adds nodes into the current scene that loaded from another X3D scene, retrieved via a local or online url address. The supporting Chapter 3 slideset and course videos (NPS, YouTube) for X3D for Web Authors are available online via X3dGraphics.com. 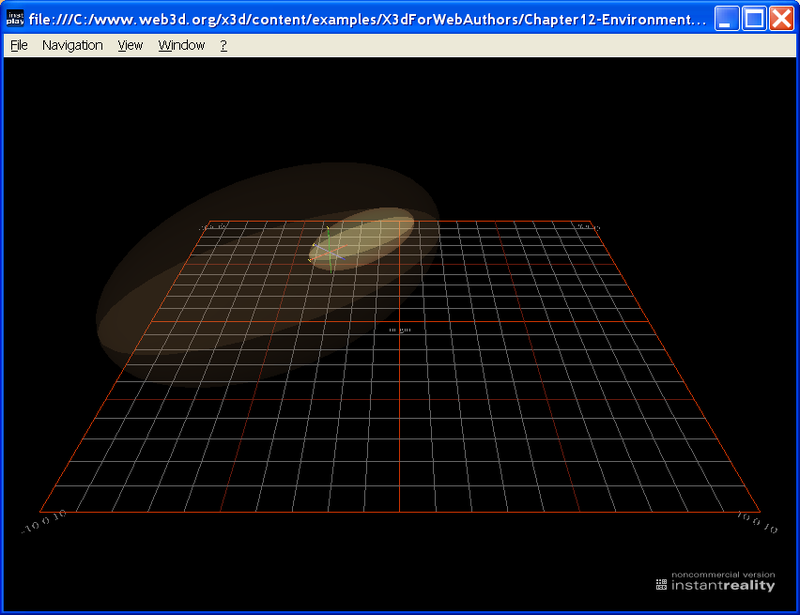 Also available: X3D Scene Authoring Hints for Coordinate Systems, Inline Scenes, Scale Factors and URL Links. Authors can design scenes to help users navigate to Viewpoints of interest, and also create user-selectable geometry links using an Anchor (just like HTML). Viewpoint nodes are the primary means for users to explore a scene. NavigationInfo nodes enable different user-interaction styles (FLY, WALK, EXAMINE etc.) as appropriate. Only one Viewpoint and one NavigationInfo node can each be active a time, with order of selection controlled via a binding stack. The supporting Chapter 4 slideset and course videos (NPS, YouTube) for X3D for Web Authors are available online via X3dGraphics.com. 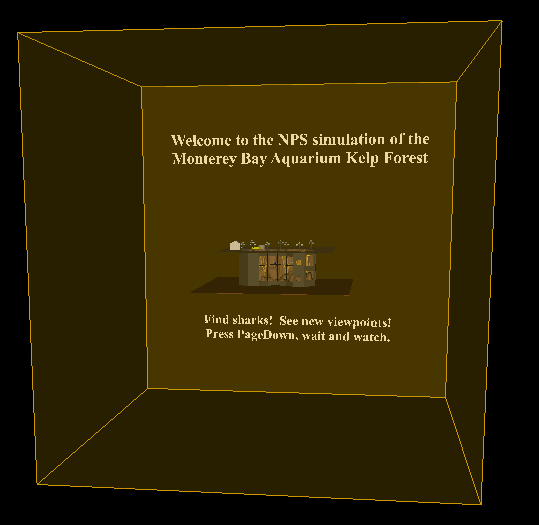 Also available: X3D Scene Authoring Hints: Viewpoints and Navigation. Appearance defines how color, material and texture images are applied as the visual characteristics of a shape. 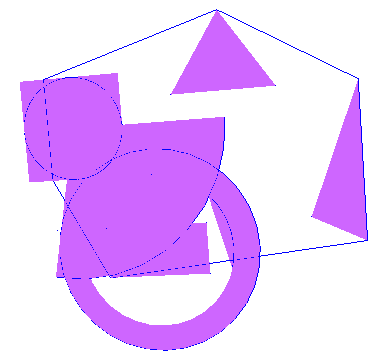 Appearance is individually associated with specific geometry within a shared Shape node. Each Appearance is a container node that can include Material, TwoSidedMaterial, ImageTexture, MovieTexture, PixelTexture and MultiTexture nodes. 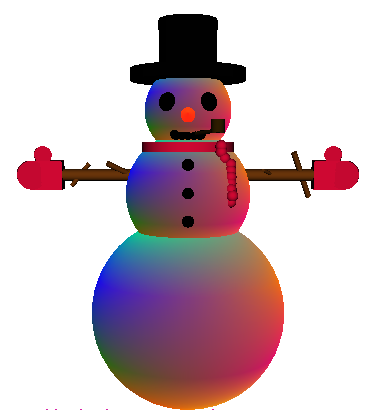 Appearance can also contain property nodes for controlling rendering and texture: FillProperties, LineProperties, TextureProperties, TextureTransform and MultiTextureTransform nodes. The supporting Chapter 5 slideset and course videos (NPS, YouTube) for X3D for Web Authors are available online via X3dGraphics.com. 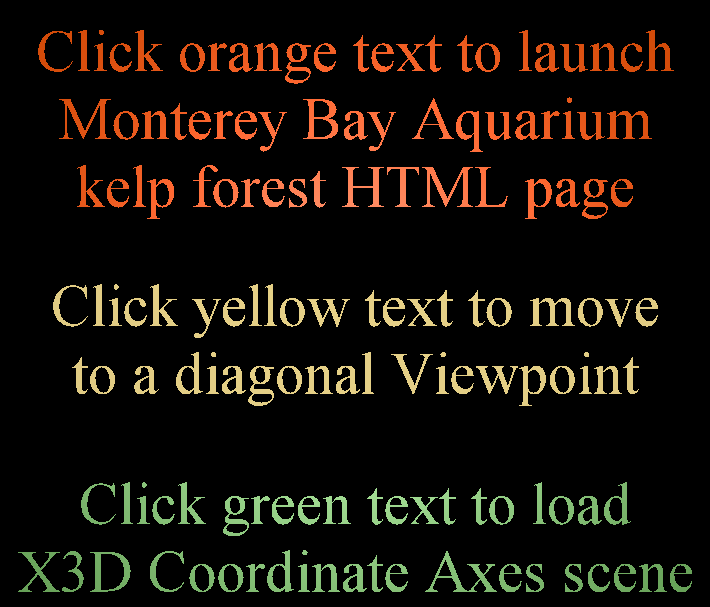 Also available: X3D Scene Authoring Hints for Images and Videos and URL Links. Numerous X3D nodes are available for presenting points, lines, and a variety of polygonal meshes. Many kinds of geometry can be created using PointSet, LineSet, IndexedLineSet, IndexedFaceSet, ElevationGrid and Extrusion nodes. Each is placed individually inside a Shape node. 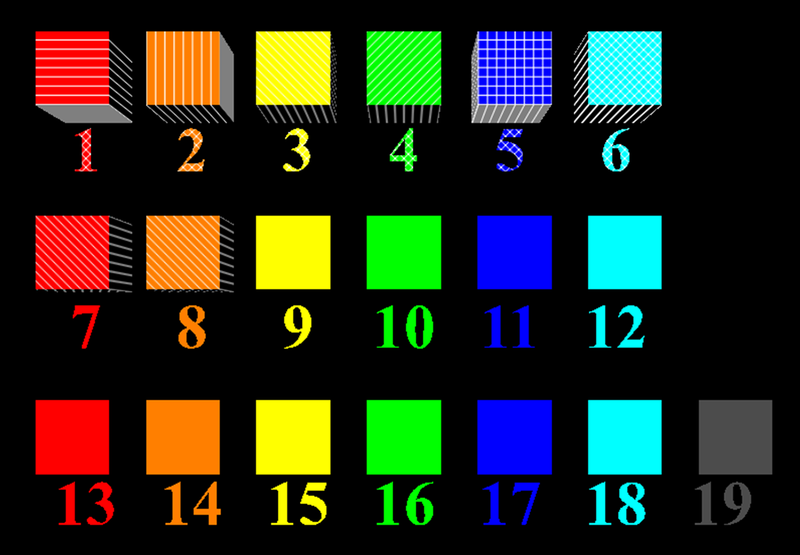 Geometric properties are controlled by Color, ColorRGBA, Coordinate, CoordinateDouble, Normal, TextureCoordinate, TextureCoordinateGenerator and MultiTextureCoordinate nodes. The supporting Chapter 6 slideset and course videos (NPS, YouTube) for X3D for Web Authors are available online via X3dGraphics.com. Also available: X3D Scene Authoring Hints: Meshes. Event values can be generated through TimeSensor, ROUTE and interpolator chains to create animation effects in a scene graph. 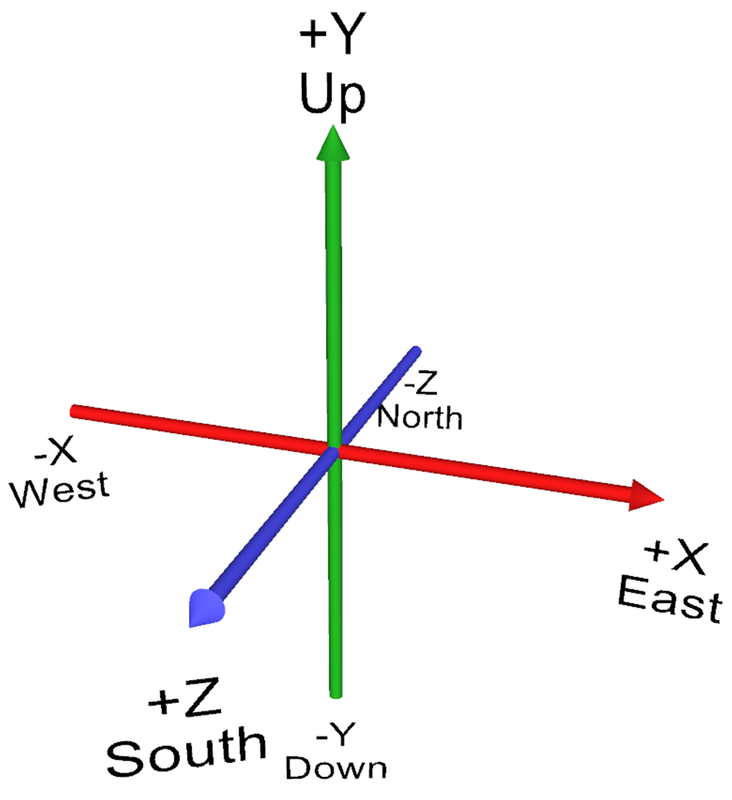 Event animation and interpolation is accomplished by ROUTE connections that pass events between nodes. 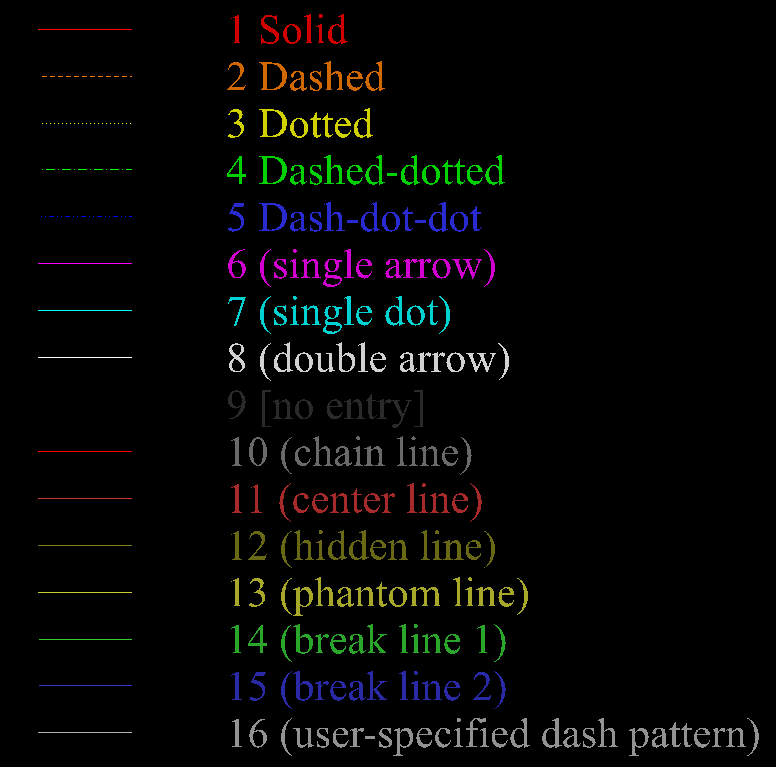 Strong typing requirements ensure that only valid values are allowed to modify the scene graph. The TimeSensor node produces output stimulus events that track the passage of time intervals using the computer clock. Strictly typed interpolation values are produced by ScalarInterpolator, ColorInterpolator, PositionInterpolator, PositionInterpolator2D, OrientationInterpolator, NormalInterpolator, CoordinateInterpolator, and CoordinateInterpolator2D nodes. The supporting Chapter 7 slideset and course videos (NPS, YouTube) for X3D for Web Authors are available online via X3dGraphics.com. A variety of sensors detect user interactivity with a scene, allowing authors to define animation responses in a device-independent, display-independent way. 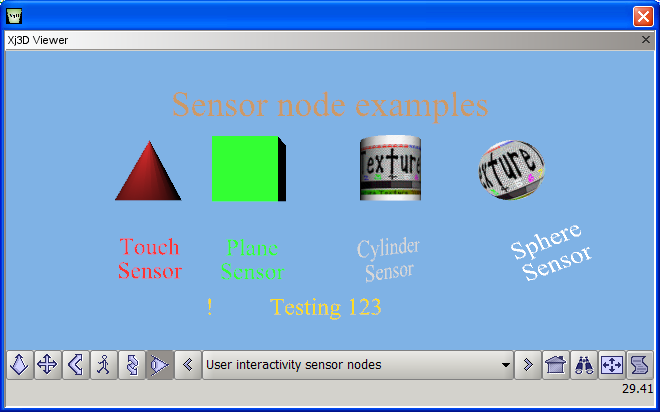 User interactivity is accomplished by sensing user actions, which create events that are sent via ROUTE connections. Sensor output values are produced by LoadSensor, CylinderSensor, PlaneSensor, KeySensor and StringSensor nodes. 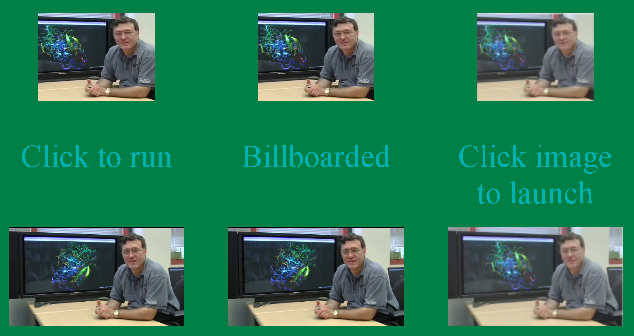 The supporting Chapter 8 slideset and course videos (NPS, YouTube) for X3D for Web Authors are available online via X3dGraphics.com. 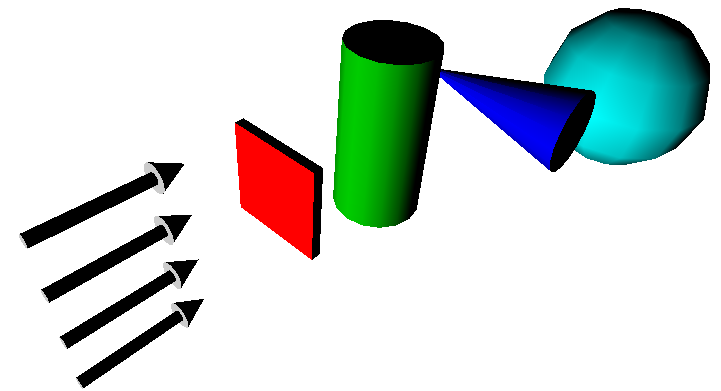 Light nodes make the appearance of geometry visible and viewable in a scene. Lights illuminate geometry in a scene relative to the user's view. 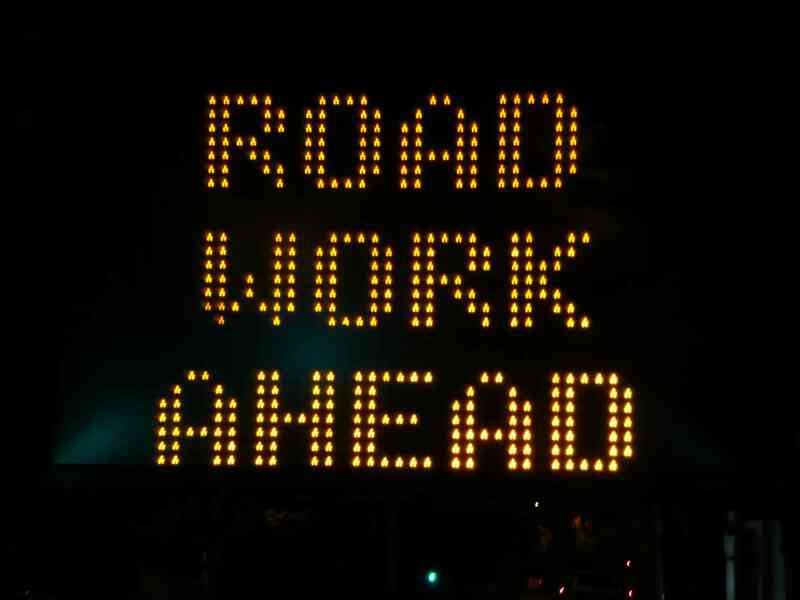 Lighting nodes include DirectionalLight, PointLight, SpotLight, and the active NavigationInfo headlight (which points along the user's viewing direction). Environmental effects include Background, TextureBackground, Fog and LocalFog. Each set of light nodes, NavigationInfo nodes, background nodes and fog nodes are bound on a separate binding stack, meaning that only one of each can be active at a time. The supporting Chapter 11 slideset and course videos (NPS, YouTube) for X3D for Web Authors are available online via X3dGraphics.com. Environmental sensors detect user visibility proximity and collision, while 3D spatial sound sources can greatly improve user engagement in a scene. Event-producing environmental sensor nodes include LoadSensor, ProximitySensor, and VisibilitySensor. Audio nodes include Sound for aural spatialization and AudioClip for identifying sound files. MovieTexture nodes can also be used as an audio soundtrack source. 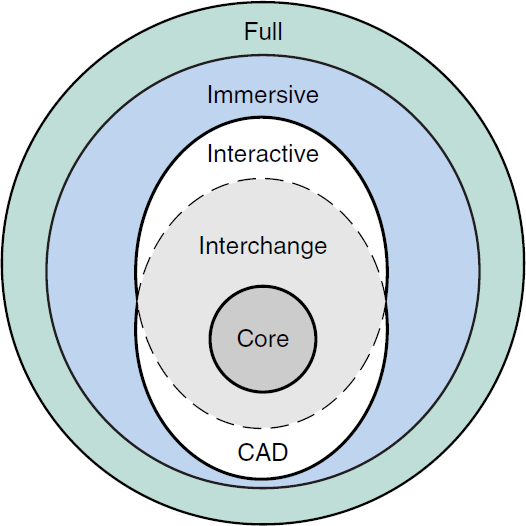 Relevant X3D Specification resources include the Environmental sensor component, Sound component and Texturing component. The supporting Chapter 12 slideset and course videos (NPS, YouTube) for X3D for Web Authors are available online via X3dGraphics.com. 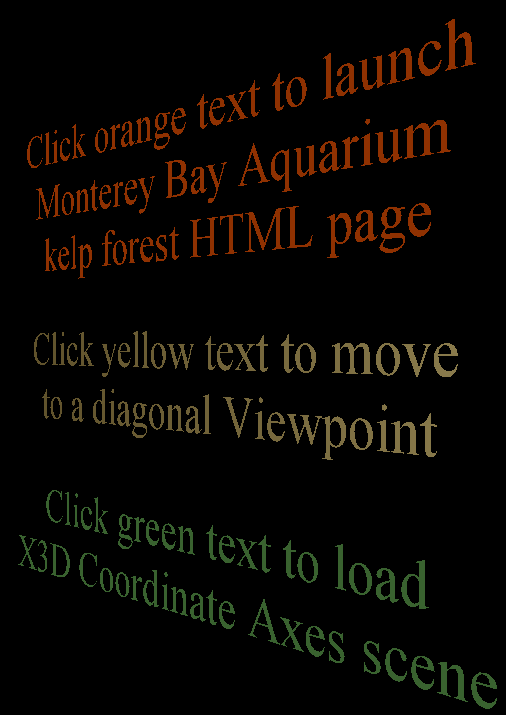 Also available: X3D Scene Authoring Hints for Audio and URL Links. Triangles and quadrilaterals are fundamental geometry representations that are typically created by authoring tools to build complex polygonal meshes and shapes. 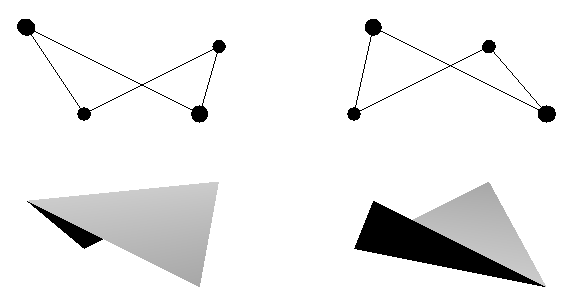 Low-level high-performance nodes for geometry definition and fast rendering include TriangleSet, TriangleFanSet, TriangleStripSet, IndexedTriangleSet, IndexedTriangleFanSet, IndexedTriangleStripSet, QuadSet and IndexedQuadSet. Special definition rules apply to each node in order to best match underlying graphics hardware requirements. Each is placed individually inside a Shape node. The supporting Chapter 13 slideset and course videos (NPS, YouTube) for X3D for Web Authors are available online via X3dGraphics.com. Metadata is used to identify the data relevant to X3D scenes and shapes, enabling the possibility of further correlation, discovery and Web-based mashups to occur. 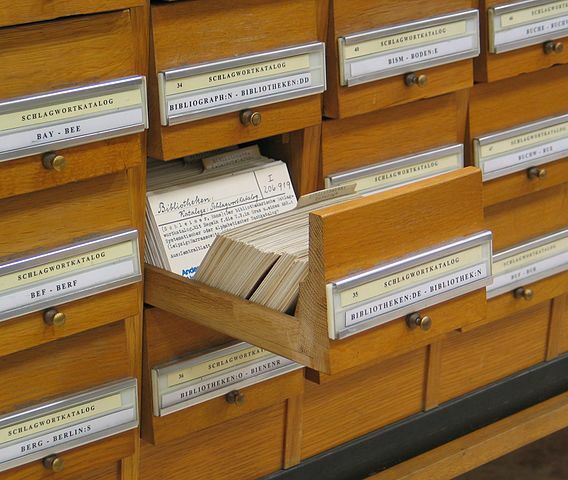 Metadata is about forms of data relating to other data. 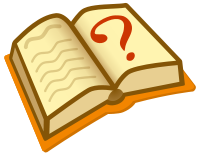 For example, metadata can provide a variety of information regarding a document such as author, date revised, relevant key words, etc. As another example, metadata might annotate X3D CAD geometry to provide key references such as part numbers, documentation references, inventory links, etc. Simple name=value paired information can be provided in document <head> and <meta> tags, just like in HTML. Furthermore, typed metadata information can annotate any X3D node, either for use offline or for queries within an active scene graph at run time. 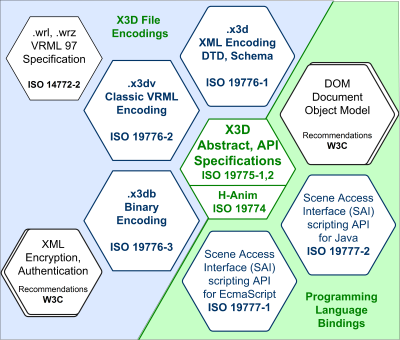 X3D metadata nodes include MetadataBoolean, MetadataDouble, MetadataFloat, MetadataInteger, MetadataString, and MetadataSet (a set holder which contains a collection of other X3D Metadata nodes). Savage Modeling and Analysis Language (SMAL) Resources reference website, plus Savage/Tools/SMAL example-archive template scenes showing matching X3D/XML metadata. 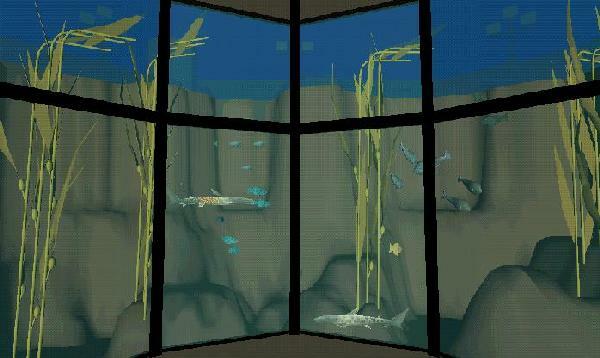 Rauch, Travis M., Savage Modeling and Analysis Language (SMAL) metadata for tactical simulations and X3D visualizations, Masters Thesis, Naval Postgraduate School, Monterey, California, 2006.